May you find learning and growth of all kinds. May you gain independence and feel comfort in your Jewish identity. May the mosquitoes be guided away from you, and may the raindrops not fall into your tent (too much). May the food be delicious and the pool the right temperature. May you seek out new experiences and try new things (vegetables would be nice but I'm doubtful). Rabbi Phyllis ended her beautiful prayer, "May you return home in one piece with all your belongings, and may you ever yearn to return to the land of summer camp." My son returns home from summer camp this morning. He was only gone for ten days, but these were the longest ten days of my life. I truly missed him like crazy. I had only been apart from him for this long twice before when I led trips to Israel, but at least then I knew he was safe at home with his mommy. Like any father, I was worried about him. He wasn't in a strange place because he essentially grew up at this Jewish summer camp. We spent the past several summers there as a family while I worked as the rabbi of the camping agency. But this was his first time away from home by himself so I was naturally concerned. Would he make new friends? Would he get enough sleep at night? Would he remember to put on sunscreen? Would he be homesick? Tashuv Eleinu... May you return to us feeling energized by your first experience at camp. Tashuv Eleinu... May you return to us having forged lasting friendships. Tashuv Eleinu... May you return to us a little more mature and a little more independent. Tashuv Eleinu... May you return to us feeling pride in your Jewish identity. Tashuv Eleinu... May you return to us free of sunburn and too many mosquito bites. Tashuv Eleinu... May you return to us having missed us but without having been homesick. Tashuv Eleinu... May you return to us eager to share your camp memories with us. Tashuv Eleinu... May you return to us ready to return to camp for many more magical summers to come. 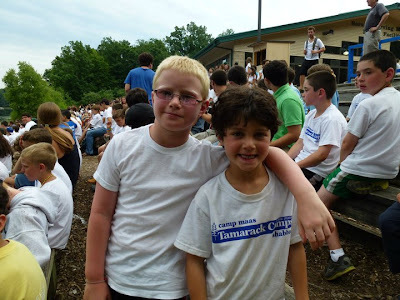 As a father, I am so grateful for the powerful gift of Jewish summer camp and I am confident that my son's experiences of the past week-and-a-half have ignited a Jewish summer camping spark in him. If you want to know why The Michigan Citizen gave such a positive review, look at the publisher. He's Bernard Kilpatrick's best friend. There's a great article on mlive.com that shows the family connection between the Citizen and the Kilpatrick clan. I notice that your father's prayer doesn't include "with all of your belongings." I guess mothers are still usually responsible for replacing lost clothes? I know as a father I would feel, if you come home with good self-esteem and Jewish identity, dayenu, you would have outgrown those clothes anyway. My daughter went to camp, three summers ago. Now she counts her year by summer camp count-down. I honestly think I did the same. My lifelong friendships are still from my camp as a 16 year old. I was so pleased to read about Jewish camps accepting all kids, I saw posts today on linkedin, Jewish Journal and other places about their children with special needs attending camp as well. I get teary eyed thinking about how wonderful and accepting Jewish camps are. Your summer camp prayer was wonderful. As a father of 2 kids who lived at Ramah Darom for many years, and one who is now Rosh Music there, I truly can appreciate it. It shows that love your son so much. I wish I also had a son but we are very blessed of having two cute daughters who both love gymnastics. I really love this Summer Camp Prayer.It gives me a lot of inspiration for my kids.Thank you for sharing this experience. The Jewis Kids camp provides kids with a positive Jewish experience and strong life-long Jewish connections.